LinkedIn has over 400 million users, making it the largest professional network, and an ideal place to find that dream job. But with such a large user base it can be hard for one person to stick out from the crowd. That’s where Saylor Academy can help. At Saylor Academy, we believe in using free and open education to help you get that degree, develop your skills, or learn for fun – but whatever your approach, adding Saylor Academy course certificates to your LinkedIn profile can give you a leg up on the competition. More than just a resume or c.v., LinkedIn is like a database of all your experience, including informal learning. With our partner Accredible, Saylor Academy offers digital certificates that are a natural fit for your LinkedIn profile. Unlike a traditional certificate, Accredible certificates encourage the adding of data, such as time spent on the course, final grade, notes taken, written assignments, and any other evidence items that you produced taking the course. In essence, your certificate becomes a record not just that you learned, but of how you learned and how you progressed throughout your course. No matter what your career path may be, there is one constant and that is change. The best way to adapt to this change is through education. If employers see that you are striving to better yourself and ‘stay young’ they will see in you an employee ready to grow with the company. Speaking of change, we have just redesigned our certificates with a more ‘classic’ look that will reward everyone clicking through that great LinkedIn profile of yours. 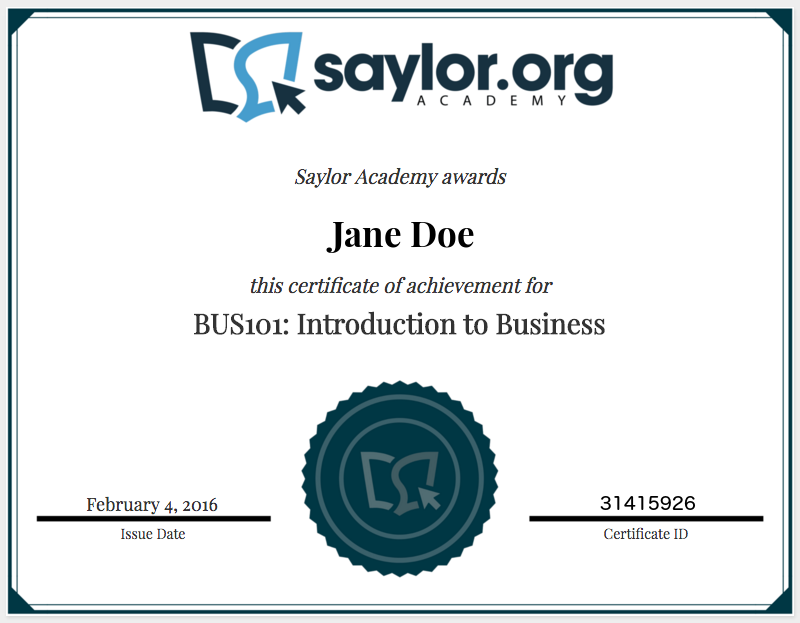 Your Saylor Academy Certificates can now be accessed through certificates.saylor.org/[certificate ID number] in addition to www.accredible.com/[certificate ID number]. P.S. : If you need help writing or polishing your resume, take our free Resume Writing course…then add your certificate to LinkedIn!